Customers could be disconnected from the service if payments are not made. Notification of delinquent status and the date the service is scheduled for disconnection will appear on the monthly billing statement. If the service is disconnected for nonpayment, the customer must pay all delinquent bills plus a reconnection charge to restore the service. The customer should avoid making payments late in the working day. (Consider department work loads to avoid an overnight without water.) Please recognize that personal checks will not be accepted for the payment of delinquent accounts. The Public Utilities Department does not want to disconnect anyone from water and sewer services. If you anticipate a problem making your payments, or have questions about your billing, please call 540-434-9959 and a customer service representative will be able to assist you. Treasurer's Office in the Municipal Building located at 409 South Main Street, Harrisonburg, VA 22801. Bring the payment and the return stub to the City Treasurer's office during normal business hours (8:00am to 5:00pm, Monday – Friday) to obtain a receipt. Payments will be applied to the account the following business day. 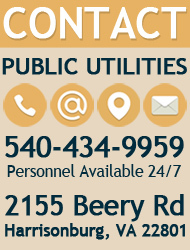 Department of Public Utilities located at 2155 Beery Road, Harrisonburg, VA 22801. Bring the payment and the return stub to Public Utilities during normal business hours (8:30am to 4:30pm, Monday – Friday) to obtain a receipt. Payments will be applied to the account the following business day. Drop boxes near the City Municipal Building located at 409 South Main Street, Harrisonburg, VA 22801. One box is on the north side of the building near the handicapped parking spaces. There is also a night deposit slot to the left of the front doors facing South Main Street. Enjoy the convenience and flexibility of credit card payments for your utility bills. 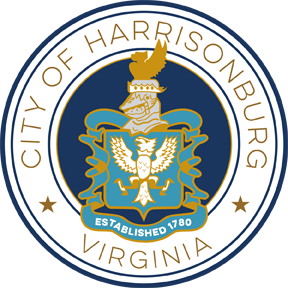 In cooperation with the City of Harrisonburg Treasurer's Office, Official Payments Corporation offers individuals and businesses the opportunity to pay by telephone or directly over the Internet. This service is safe, reliable, and in accordance with all state and federal government regulations. In order to process your payment, Official Payments Corporation, the credit card service provider, charges a convenience fee of $4.50. To pay by credit card, call the toll-free number 1-800-272-9829 or visit the City's online payment site. Tell you the total of your payment, including the appropriate fee. Issue an on-screen confirmation number and a printable receipt. Confirmation is emailed to users who request it. The charge will also appear on your credit card statement showing the payment amount on one line and the convenience fee amount on a separate line.